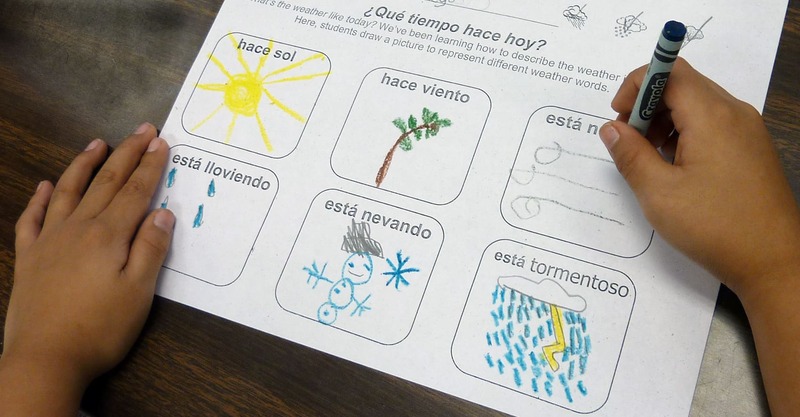 Since 2008, Charlottesville City Schools has taught Spanish to all elementary students. It is a sequential FLES (Foreign Language in the Elementary Schools) model developed by our teachers, for our schools. All students in first through fifth grade receive two 30-minute classes of instruction per week with an elementary Spanish teacher. The Spanish curriculum reinforces vocabulary and concepts that the students are learning in their core classes. Following the elementary Spanish program, sixth-grade students take either Spanish I for high school credit or an Intermediate Spanish class that prepares them for Spanish I in the future. Students participate in an original FLES curriculum that supports the division’s core content at each grade and is aligned with Virginia Standards of Learning and National Foreign Language Standards. Instruction is proficiency-oriented with teachers placing greater on meaningful communication than grammatical structure. Teachers and students use the target language as much as possible with the goal of students first understanding and then producing in the language. The curriculum has a spiral design, so that greater detail, rigor, and breadth are added to similar themes of study each subsequent school year. The CCS FLES Spanish curriculum is based on four thematic units for each grade level. Every unit includes performance objectives, cultural information, and a thematic/linguistic focus (with essential vocabulary and suggested assessments). Parents may use these documents at home to help students reinforce the Spanish phrases they learn in class.